Polish universities want to regain 107 Polish scientists working abroad as part of the first edition of the Polish Returns Program. The research teams they will build aim to create a new quality in the Polish science. 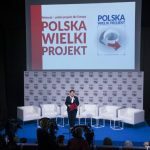 Two Polish ministries, the Ministry of Science and the Ministry of Finance, are working on programs that will interact in an attempt to jump-start activities in scientific research conducted with the aim of domestic commercialization. The Ministry of Science wants to lure back young Polish scientists who could initiate research projects in Poland that will find real-world applications. “After all, this is not about every scientist working abroad, but about those who will bring tangible benefits to Polish science and teaching. The Warsaw University has submitted the most applications. We are very happy about the fact that several private universities and small research units focused on very specific fields, such as nuclear physics, are also participating in the program,” said Anna Chylak, the Marketing Director of the National Agency for Academic Exchange. 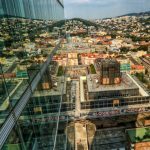 Deloitte in its report analyzing innovation in the Central Europe confirms that a lack of qualified scientists is one of the biggest challenges for companies operating in the region. “Over several decades, thousands of scientists have left Poland — talented, young people — went abroad in search of the right conditions to pursue scientific work and the creative exchange of ideas. Today, we have conditions to invite them back to Poland,” said Deputy Prime Minister Jarosław Gowin, during the inauguration of the Polish Returns Program at the beginning of 2018. Under the program, a scientist can receive an annual salary of up to PLN350,000 for 4 years as well as the opportunity to create their own research group. The universities get an opportunity to strengthen their scientific potential and to employ good scientists without incurring additional costs, states the Ministry of Science. This cooperation is supposed to allow greater internationalization of researches — access to specialists with international experience and the ability to raise funds for researches. The new program still constitutes a huge leap for Polish science, which is noticed abroad. In her latest work for the OECD “Strengthening innovation in Poland”, Nicola Brandt notes that “creating attractive career paths for researchers in Poland that are compatible with those in other countries and offering interesting grants for short stays in Poland will be crucial for success.” In her opinion, it will also be important to send Polish researchers to foreign institutions and to initiate the formation of international research teams in Poland, because in this way it will be possible to attract foreign researchers to Poland. The more money flows to Polish researchers the sooner Polish universities learn how to operate in a modern way. Effects of their work may reach the real economy, because Poland’s government prepared the so-called Intellectual Property Box – IP Box. Since January 1st, 2019, the IP Box is a tax incentive for entrepreneurs using Polish inventions. “What is important in the context of IP BOX (in accordance with OECD BEPS No. 5) is the requirement for the intellectual property to be legally protected. It does not matter whether this will be protection resulting from the decision of the Polish Patent Office or from a European patent,” said the Finance Ministry. 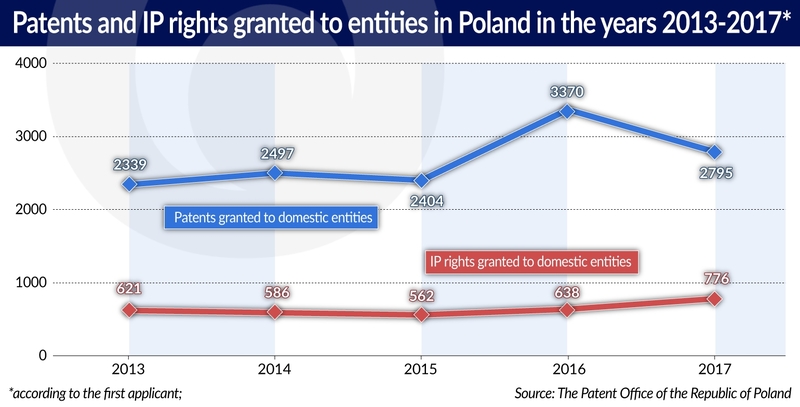 In 2017, the Patent Office of the Republic of Poland received 3,924 applications for patent protection in the domestic mode (which marks a decline compared to 2016, when 4,261 applications were submitted). The total number of domestically submitted inventions, utility models, trademarks and industrial designs amounted to 20,725 and also decreased slightly in relation to 2016 when it reached 21,375. 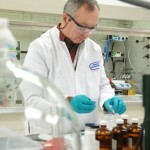 The clear peak recorded in 2016, which is visible in the statistics of granted patents and other forms of industrial property protection can be attributed to an intensive seven-year-long period of financing innovations under the European Union’s Operational Program “Innovative economy” with a total of EUR10bn. Moreover, the seven-year-long recapitalization of the process of innovation did not give any lasting results — after the 2015-2016 peak there was a visible drop in patent applications and a sharp decrease in the number of patents granted in 2017. “The decline was not very significant and to a certain extent reflects the economic cycle, but the number of patents always reflects the economic cycle with a certain delay. If the Polish economy continues to grow, then more patents will be granted. 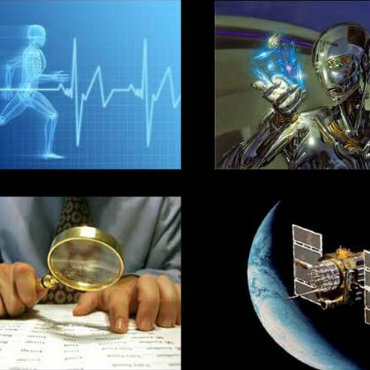 Moreover, in the global economy there are various intellectual property protection systems. Some entrepreneurs choose the European patent,” emphasized Adam Taukert, a spokesman for the Polish Patent Office. The data of the European Patent Office (EPO) reveal a very positive trend. Back in 2007, entities from Poland submitted only 168 applications to the EPO. For comparison, German entities filed over 25,000 applications, Belgian entities filed 1,900 applications, and entities from tiny Luxembourg submitted as many as 250 applications. Exactly 10 years later, in 2017, Polish researchers, companies and scientific institutes filed a total of 628 patent applications at the EPO (the data was provided by the Polish Patent Office in the annual report for 2017). This increase placed Poland in the lead among the countries that increased the number of applications from year to year. A total of 216 European patents were granted to Polish applicants in 2017. Altogether, 166,000 patent applications from around the world were submitted to the EPO in 2017. China is particularly active in this field and has just became one of the five most active countries in terms of new patent applications (following the United States, Germany, Japan and France), after pushing Switzerland off the fifth spot. For the time being, the EU is catching up with key competitors such as Canada, Japan and the United States. 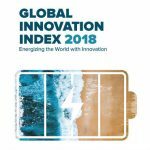 According to the ranking published in June 2018, Sweden remains the EU’s innovation leader, followed by Denmark, Finland, the Netherlands, the United Kingdom, and Luxembourg, which joined the group of innovation leaders this year. Interestingly enough, Germany dropped down to the group of strong innovators, while Poland is ranked among the so-called moderate innovators. The growing desire to patent projects not only on the domestic market, but also on the European scale, allows us to believe that innovators are now beginning to see the future benefits. The IP Box project aims to ensure that the patented solutions are more frequently implemented and that their implementation is carried out domestically. Mr. Taukert offers a very cautious estimate, according to which at present only about 10 per cent of the patents are implemented to production (there are no accurate statistics in Poland this regard). Although the quality of scientific work of Polish universities and research institutes is the subject of harsh criticism, these entities are still the main driving force behind the Polish patent activity in Europe (unlike in most European countries). Paradoxically, the weakest link in the chain of innovation development is the one which could also be its biggest beneficiary — the business community. Poland is ranked 38th out of 127 countries in the Global Innovation Index. Meanwhile, the neighboring Czech Republic is ranked 24th. “As much as 21 per cent of Polish companies declare that they do not spend any money on R&D. This percentage is twice as high as the region as a whole,” said Dominika Orzołek from Deloitte. The Central European Corporate R&D Report 2018 confirms that the level of innovation in Poland is much lower than the EU average. However, the authors optimistically assume that the recent changes in the area of tax incentives, supporting research with non-repayable grants and programs, such as Polish Returns, will change the attitudes prevailing in the business community. For the time being experts continue to criticize the entrepreneurs for many things: a lack of vision, lack of R&D, lack of cooperation with universities and lack of involvement in the implementation of inventions, lack of long-term strategies aimed at innovative development, lack of greater needs, lack of creativity which would encourage scientists and researchers to develop specific solutions tailored to the needs of a given company, industry, field or problem, and, worst of all, a lack of willingness to change the current situation. “Cooperation is currently driven by scientists, and not by business, because the latter lacks any vision. Industry does not notice projects that could bring benefits in 20 or 30 years. Companies fail to engage in long-term thinking, where there would be some room to consider what could be achieved and what could be lost in 40 years. Meanwhile, the potential for such achievements is clearly shown by companies such as Samsung, Apple and Microsoft,” said Adam Czyżewski, the chief economist at PKN Orlen (the biggest Polish oil&gas company). “We do not feel the effects of the innovation policy. First of all, there are no sources of financing that would allow for the implementation of the entire project — from the design phase to the stage of finding a place on the global market. Secondly, it is the state that should generate demand in order to stimulate the development of technology, “ said Robert Dwiliński, PhD, from the Technology Transfer Office at the Warsaw University. In discussions concerning innovation the same arguments have been brought up for many years: the lack of capital, the lack of cross-sectoral agreement, the lack of tax incentives, and the lack of ability to take advantage of such incentives once they are introduced. According to Deloitte, only 11 per cent of the surveyed companies in Poland are aware of actively take advantage of tax incentives resulting from the R&D. Dorota Rzążewska, a patent attorney, believes that it is necessary to develop more flexible rules for cooperation between business and the world of science, because it is still very difficult to work out an agreement that would be acceptable to both parties. “Researchers think mainly about grants and credit points, and not about achieving strategic or business goals. Meanwhile, business is mainly concerned about the lack of capital. The financing of intellectual property is especially important for small and medium-sized enterprises, and the majority of companies in Poland belong to that category. If we expect them to be innovative, we should provide them with support,” she said. Companies are not taking advantage of tax incentives not because they do not want to, but because they don’t know how to do it or are afraid of possible errors. A large company can deal with it but small businesses — 90 per cent of the Polish economy — prefer not to take any chances. The lack of trust in institutions, which constitute a part of the social capital (alongside social and business connections), is the most important factor hindering innovation. Poland’s central bank, NBP analysts emphasize that the level of investment in innovation in Poland is lower than would be expected based on the innovative potential of the Polish economy. One of the reasons is the low level of social capital. According to the authors of NBP’s report entitled “The innovative potential of the economy: conditions, determinants, perspectives”, this is due to the fact that the level of trust in institutions and legal regulations in Poland is low, but also due to the fact that Poles don’t trust each other – the level of social trust in Poland is at least twice as low as the average in the most innovative countries. Meanwhile, “trust is an important factor, because in today’s world the creation of innovative products is largely associated with the need for cooperation,” wrote NBP’s experts and cite various studies documenting the impact of social trust on the growth of GDP per capita, the number of granted patents, and the level of R&D spending. In total, expenditure on R&D in Poland does not exceed 1 per cent of GDP. In China, which is smoothly transitioning from an economy based on imitation to an innovative economy, this expenditure reaches 2 per cent of GDP. “In Poland the government invests 0.41 per cent of GDP, and companies invest even less — 0.16 to 0.17 per cent of GDP. Why so little? As long as entrepreneurs stick to the philosophy of investing in cheap labor, there will be no need to invest in new technologies. This has been Poland’s economic offer for many years, but today it is a dead-end street. 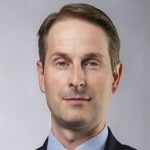 People in Poland, including politicians and managers, have to finally discard the philosophy of cheap labor because Poland can no longer successfully compete in the global market with low wages,” stressed Adam Witek, PhD, Director of the Institute of Ceramics and Building Materials. The previous sources of Poland’s rapid economic development are gradually being exhausted, and they should be replaced with innovation. Economists from NBP placed particular emphasis on this conclusion in their report. “Over the last quarter of a century economic growth was based on a rapid accumulation of capital, an influx of modern technologies from abroad, and a rapid increase in society’s level of education. (…) We are already seeing the barriers to the effectiveness of the current development model. (…) The key to future economic growth in Poland will be the increase in total-factor productivity. In turn, the most important mechanism allowing for dynamic growth in total-factor productivity is technological progress achieved thanks to the innovativeness of the domestic economy and the skillful utilization of the effects of the international diffusion of innovation,” they wrote in the report. In times of rapidly changing technologies which can be accessed by almost everyone, a breakthrough invention, such as a novel medical treatment method, could be as important as, for example, a thoughtful and seamless system of payment for municipal services. the revolutionary “LUNA” robot, which conducts the automated rehabilitation of patients. Poland’s goal is to increase R&D spending from less than 1 per cent of GDP (in 2017 Poland’s GDP reached USD470bn) to 1.7 per cent by the end of 2020. There are abundant sources of financing available — in the years 2014-2020 Poland will receive approx. EUR105bn in EU funding. And in the future the EU institutions will not be the only ones holding Poland accountable for how it uses these funds.